December 7, 2011 by ath 0 comments on "PaperSourceExplorer"
Run the executable, either by using the shortcut created using the installer, or by double-clicking the executable in Windows Explorer or equivalent file manager. View the information available from each printer installed. The Windows default printer is selected and expanded in the treeview by default. 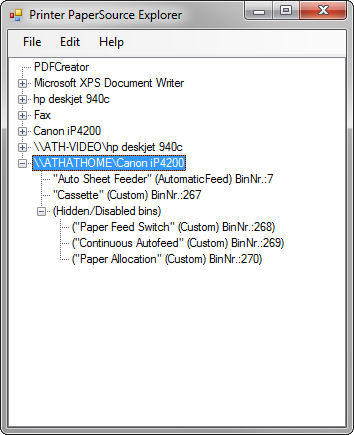 Select File/Print from the menu, or press Ctrl-P, to print a list of available input trays and all other selected options, for the current or all printers (selectable by All pages or Current page in the printer selection dialog). Select Help/About to display some information about the application. Select Help/Check for Updates... to run dcuhelper.exe, for finding and running DCUpdate to check and fetch updates if available. Only manual check for now. This quits PaperSourceExplorer when a check for updates is confirmed/allowed. Expand All Nodes : Display with all nodes expanded (toggle). Display Hidden/Disabled bins : Show a tree sub-node for each printer with the Hidden/Disabled bins found (if any) (toggle). Enabled by default. Display Runtime bin-names : Adds the bin names known by the Windows printserver at runtime. These (often/usually) differ from the driver bin names (toggle). Display Unrecognized Runtime bin-names : Show a tree sub-node for each printer with Runtime bin-names that couldn't be matched to a driver bin-name (toggle). Enabled by default. Display Mediatypes : Show the available media types known by the driver.